AUSTIN, TEXAS – Allegiant Air has announced new, twice weekly, nonstop service from Austin-Bergstrom International Airport (AUS) to Pittsburgh International Airport (PIT) and St. Pete-Clearwater International Airport (PIE). AUS-PIT flights launch on Dec. 16, 2016, followed by AUS-PIE on Feb. 17, 2017. To celebrate, the company known for its ultra-low fares is offering one-way fares on the routes for as low as $44. Tickets and flight days and times are available at www.allegiant.com. 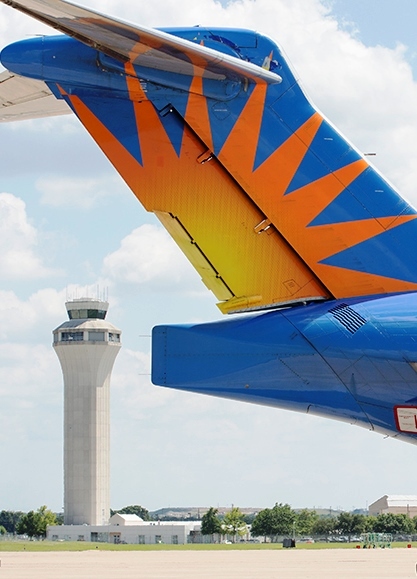 “We welcome Allegiant’s continued growth from five to now seven nonstop destinations in AUS, with the addition of the Pittsburgh and Tampa/St. Petersburg new routes,” said Jim Smith, Executive Director, Austin-Bergstrom International Airport. Both new routes will operate twice weekly. The PIT nonstop will fly on an A319 (156 seats) and PIE will operate on a MD-80 (166 seats) or A320 (177 seats). Allegiant air service debuted in Austin in October 2013 with nonstop flights to Las Vegas. In the last two years, the carrier has grown at AUS to include flights to Albuquerque, Memphis, Cincinnati, and Orlando. The airport of choice for Central Texas is Austin-Bergstrom International Airport (AUS). Austin-Bergstrom extends a thank you to its airport partners and its 11.9 million passengers in 2015. Fly Austin on new nonstop destinations including Guadalajara, Mexico on Volaris, www.volaris.com, and Mexico City, Mexico on AeroMexico, www.aeromexico.com. Find all nonstop routes with the free interactive flight guide on www.abia.org. Connect with us on Twitter, @AUStinAirport, and Facebook, www.facebook.com/abia.